Our power tool accessory reviews include products such as impact-rated bits, driver bits, bit holders, hole saws, spade bits, and more. If you care about power tools, then the accessories are what make or break your daily use. Choose the right power tool accessories, and your tools will last longer, cut or drive faster, and increase productivity. When we do power tool accessory reviews we line up the latest products of a particular category and ensure everything if fair. Variables other than the power tool accessory are eliminated. That means we use the same tools. We apply weights when possible to ensure cut consistency. We do everything in our power to eliminate as much bias as possible. A great example is when testing reciprocating saw blades. We’ll use weights to ensure the saws are applying the same amount of downward pressure on the blades when cutting. Material will be utilized which is as uniform as possible. This avoids knots or other irregularities. In the end, the right accessories will change everything. 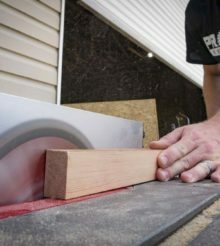 Put a bad bit or blade in a tool and it will perform like a lesser tool. Use the right accessory, and your day will go more quickly. Klein Magnetic Wristband – Get a Grip on Your Loose Screws!